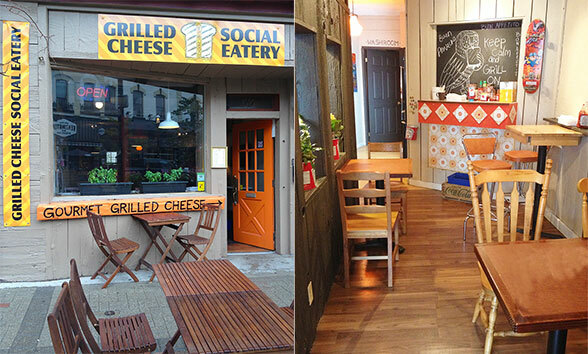 The Grilled Cheese Social Eatery: I was a little confused when I walked past this restaurant. I would have never thought that someone would actually create a restaurant catered to grilled cheese – however, I am ever so glad that one now exists in Barrie. My family and I decided that we would see what this restaurant has to offer because we all have an insane love for grilled cheese. The restaurant is small and cosy, paneled with wood and various paintings that have grilled cheese themes. To order, you walk up to the counter at the back of the restaurant and choose from a chalkboard full of different types of grilled cheese. The Grilled Cheese Social Eatery offers a variety of combinations that I never would have thought would be good on a grilled cheese sandwich. You have to wait for your food to be cooked and brought to you, but the wait is not very long. Being gluten free, I ordered “The Classic,” which is cheddar cheese between two slices of gluten free bread. Maybe it was the gluten free bread, maybe it was the cheddar cheese, but all I know is that this grilled cheese sandwich had me begging for more. It was so delicious! My mother tried the “Pierogi,” a sandwich layered with cheddar, bacon, and caramelized onions with sour cream on the side for dipping. My brother ordered the “Wake N Bacon,” which had cheddar cheese, bacon, and fried eggs loaded on gluten free bread. My brother’s girlfriend tried the “Dill-licious,” a sandwich of Havarti cheese, dill, sun dried tomatoes, and caramelized onions. My family was just as pleased with their meals as I was. With every meal, there is an option of a salad or chips. We all chose salads (fresh greens, cucumbers, and tomatoes with a citrus vinaigrette as the dressing) and were perfectly satisfied. You dine out of little baskets with checkered liners and use plastic forks. I could not help but be reminded of eating at a chip truck – it was such fun! This restaurant also has vegetarian and vegan options available so anyone can enjoy eating here. Under $10 for every option, the meal portions are fair for the price you are paying. I was thoroughly impressed with this restaurant. I left satisfied and very pleased with the quality of the food, the service, and general atmosphere of the restaurant. The Grilled Cheese Social Eatery is located at 53 Dunlop Street East. Open every day for lunch, the restaurant is open from 11am until 5pm on Monday to Wednesday, and 11am until 7pm Thursday and Friday; the weekend hours on Saturday and Sunday are from 12am to 3am, and reopens at 10am until 5pm: a nice place to take your starving belly at the wee hours of the night.